Evelyn Chapman trained in Sydney under the Italian-born artist Antonio Dattilo-Rubbo, together with fellow students Grace Cossington Smith and Norah Simpson. She moved to Europe with her family in 1911 and attended the Académie Julian in Paris, gaining a classical training in life drawing. When war broke out in 1914, the family moved to London and Chapman spent time in St Ives, Cornwell, a thriving cosmopolitan colony for artists from around the world. She began painting vivid works in tempera and oil, which evidence her assimilation of French post-impressionist techniques. In early 1919, Chapman accompanied her father, a member of the New Zealand War Graves Commission, to France, visiting the area near Villers-Bretonneux where many Australian and New Zealand soldiers had lost their lives. 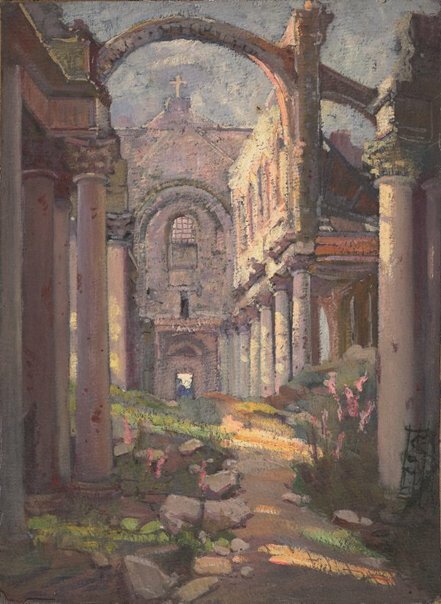 Struck by the destruction she witnessed in the villages and cities, Chapman set up her easel and began to paint the ruined buildings and landscape, annihilated by years of continued bombardment. The colonnaded remains of this once majestic church are awash with a warm diffused light. Layers of pale yellow, brilliant white and vivid green are brushed across stoney greys, to striking effect. Despite the desolation of the scene, Chapman's essential optimism is imbued in this luminous work. Anne Gérard-Austin, Look , 'Remembering Evelyn Chapman: a new and unexpected bequest', pg. 14-15, Sydney, Apr 2015, 15 (colour illus. ).